The whoosh of tyres sliding hopelessly on wet tarmac is something every driver fears. So was the thump! as Barrie Smith's Lola T70 smote the protective banking in front of the Grovewood Suite at Brands Hatch. No mean driver, Smith had lost the Lola all ends up at Clearways and aquaplaned half the length of the pit straight in a slow spin. Later, so would Piers Courage in the Alfa Romeo T33, and his co-driver Andrea de Adamich. Sunday April 12, 1970. Track conditions at Brands were absolutely foul, and the BOAC 1000 was in trouble from the opening lap when Smith crashed heavily and spread mud and debris across the track. Pedro Rodriguez said he didn't see the yellow flags, but he must have known about them. Some drivers were down to cruising speed, and the Mexican, racing the new Gulf Porsche 917 for the first time in Britain, unwisely passed a backmarker on the top straight. Nick Syrett, the BRSCC's Clerk of the Course, called Rodriguez in for a chat. Rodriguez failed to notice the black flag twice but called in the third time, looking impassively at Syrett while the riot act was read. Thirty seconds later, and having lost more than a minute of track time, Rodriguez turned water to steam as he left the pits, setting off in pursuit of Vic Elford in the Porsche Salzburg 917 and Chris Amon in the SEFAC Ferrari 512S. Rodriguez's own teammate, Jo Siffert, had also been to the pits with a flat rear tyre, punctured by debris. The next 15 laps of the BOAC 1000 are immortal. They sealed Rodriguez's place in motor racing legends and put the 12-cylinder, 4.5-litre Porsche on a pedestal too. Rodriguez simply dominated the track, slicing two or three seconds at a time off Amon's Ferrari, which had moved ahead of Elford's Porsche. The effect was much the same as when Juan-Manuel Fangio caught and passed Mike Hawthorn and Peter Collins in their Ferraris, at the Nurburgring in 1957. It was such a masterful performance that everything else paled into insignificance, and even Rodriguez's keenest rivals were forced into a state of open-mouthed admiration. 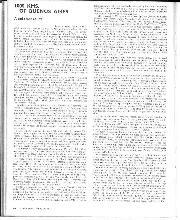 the Rodriguez caught Amon at Paddock Bend at the start of the 20th lap, and despite the spray which practically blinded him the Mexican took a classic inside overtaking line, muscled past, and proceeded to pull away at a rate of three seconds per lap. After that, the race was for second place. Rodriguez had lit up and gone! This formula was short-lived, but shines in racing history like a beacon. The heavyweight battles between Ferrari and Ford, and Chaparral, with five, six or seven litres, were mighty enough in preceding years, and the FIA was sufficiently moved to have the formula put to an end. What followed, though, was even more epic, as first Ferdinand Piech at Porsche, then Enzo Ferrari, saw the possibilities of building a series of five-litre cars, most of which would be sold to their customers. Both manufacturers chose 12 cylinders, Porsche with a traditional air-cooled 180-degree 'boxer' engine with two valves per cylinder, Ferrari with a 48-valve 60-degree V12. Between 1968 and 1971 the FIA legislated a sports car formula for three-litre prototypes, cars such as the Porsche 908, the Alan Mann Ford F3L, the Alpine-Renault A2 10 and the Alfa Romeo 33-3, and 'homologated' cars such as the Ford GT40 and Lola T70, of which no fewer than 25 must exist. Essentially, the production line cars had stock-block engines, five-litre V8s, and any power advantage was diluted by their heavier weights: the three-litre cars, usually with Formula One engines, weighed not less than 600 kg, the five-litre cars not less than 800 kg. Nothing stood in Piech's way, once he saw the possibilities of producing the 917. 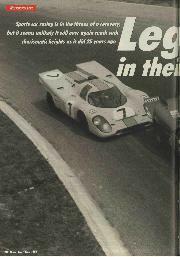 As Porsche's director of research and development he sought, and received approval in July 1968, moving ahead rapidly. Hans Mezger headed the team designing the flat-12 engine, Helmuth Flegl the team designing the tubular chassis and enveloping, aerodynamic bodywork. 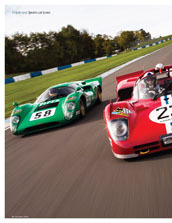 Flegl had the easy bit, relatively speaking, as the chassis and body were developments of those on the 907 and 908. The flat-12 engine pushed the driver so far forward that his feet were ahead of the front wheel axle line (as happened again with the 908/3), and the body tended to be bulbous. Straightline speed was the priority, with Porsche's first Le Mans victory the target. 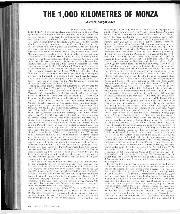 Mezger designed the engine as a pair of flat-sixes in line, with the crankshaft takeoff midway along its length. These were, in fact, derived from the 911S model complete with chain-driven double overhead cams, and a capacity of 4494 cc. The 917's engine developed 580 bhp at the outset, and up to 630 when developed to full five-litre capacity in 1970. Ing Piech reasoned, correctly, that for the sake of expediency the Porsche 917 would be adequately powered with the 4.5-litre engine, since it was bang-on the minimum weight of 800 kg. There are many stories about the 917, not all apocryphal. Of the Porsche System (factory) drivers drawing lots not to drive the 917 on its debut outing at Spa in May 1969, where chassis flexing was so bad that it kept jumping out of gear; Siffert set pole position in the 917 but Gerhard Mitter drew the short straw, and retired after one lap with damaged valve gear. Of Frank Gardner and David Piper giving this spooky car its second outing, at the Nurburgring, when all the contracted drivers thought of excellent reasons for driving the 908s. "When I went to change gear, the lever had gone somewhere else," said Gardner, of the chassis movement. "If you looked at the instruments, you'd finish up in the next county." Homologation was taken seriously. The 917 had to be raced in exactly the form it was inspected by the FIA in March 1969, and opportunity for development was limited. It was a Le Mans car, though. At the Sarthe, in tune, three 917s topped the time sheets with Rolf Stommelen quickest of all, once the FIA relented and allowed the Porsches to run with their moving tail flaps. "Rico Steinemann said they were an integral part of the car, and they couldn't run without them," recalls Richard Attwood, teamed up with Vic Elford. "Actually they didn't work very well at all, they were a complete waste of space, but Steinemann said he would withdraw the entire Porsche team if we couldn't have them, so the FIA backed down." 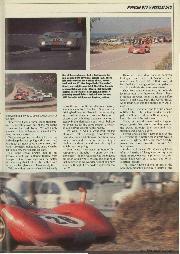 Elford and Attwood led by six clear laps after 20 hours, and seemingly had only to finish. Easier said than done, because the transmission bellhousing was cracked and oil was seeping into the clutch. After a very careful hour, Attwood went to the pits to learn the bad news. The 917 could go no further, and the stage was set for an amazing battle to the end between the Gulf Ford GT40 driven by Jacky Ickx and Jack Oliver, and the Porsche 908 of Hans Herrmann and Gerard Larrousse. In what became a very personal duel, Ickx beat Larrousse by 70 metres at the flag, so Porsche's first victory had to wait for another year. The Porsche 917 had claimed its first, and only, victim at the beginning of the race. John WooIle, the wealthy British amateur, was the first customer in line for a homologated Porsche 917. He got as far as the White House before losing control and crashing with fatal consequences. At last, the Porsche 917 won for the first time at the new Osterreichring circuit at Zeltweg. 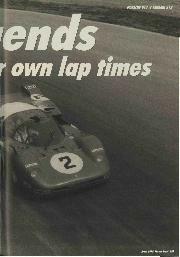 Brian Redman, lacking a little in self-confidence perhaps, opted for a 908, leaving Jo Siffert to run with Kurt Ahrens. And with further development the 917 was becoming a reasonable car to drive, though not entirely trustworthy. Siffert and Ahrens won the final World Sportscar Championship race of the season – in August – and the 917 programme was Immediately handed over to John Wyer, whose JW Automotive, Gulf sponsored team was entrusted with the running of the 917s. Wyer and his engineer, John Horsman, set up camp at the Osterreichring and modified the 917's rear bodywork, to the absolute horror of Piech and Flegl. Instead of the droopy, rounded rear body they installed an upward sweeping body, with a central channel over the horizontal cooling fan. And then, with Firestone tyres instead of Dunlops, Siffert went four seconds quicker than in qualifying! He would, of course, have won the previous weekend's race by several laps with that sort of speed at his disposal, and at long last the beast had turned into a beauty. Porsche had a long start on Ferrari, but to their credit the Italians had a marvellous new challenger ready for the Daytona and Sebring races early in 1970. Ing Mauro Forghieri, in fact, had the 512S (five litres, 12 cylinders, S for Sport) ready for exhibition at the Turin Motor Show in November '69, only eight months after the Porsche 917 was unveiled in Geneva. Unlike the Porsche it had an aluminium sheet monocoque and a full five-litre engine developing an understated 550 bhp, but it was considerably heavier at 880 kg. Three Ferrari 512Ss were entered at Daytona for Mario Andretti/Arturo Merzario, Jacky Ickx/Peter Schetty and Nino Vaccarella/lgnazio Giunti, and the golden age dawned. 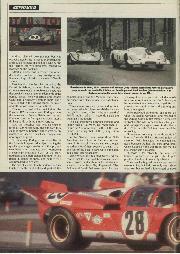 In the rival camp were two Gulf Porsches for Rodriguez/Leo Kinnunen, and Jo Siffert/Brian Redman, plus a Porsche Salzburg entry (to John Wyer's utter disapproval) for Vic Elford/Kurt Ahrens. Andretti claimed pole position but was overwhelmed by the Porsches on the banking, and could only hang on and hope. One by one the Ferraris hit tyre problems, caused by loadings on the banking. Siffert's Porsche was in trouble too, with a distributor problem, letting Rodriguez and Kinnunen forge ahead to a massive 372-mile victory. First blood to the Porsche, second to the Ferrari. At Sebring. a month later, the Porsches were seriously in trouble with a new hub design which wasn't up to the demands of the bumpy circuit. Nino Vaccarella and Ignazio Giunti had a runaway victory in their Ferrari 5I2S, joined in the closing stages by Mario Andretti, whose own car had retired. 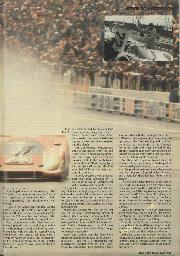 This was the last defeat inflicted on the Porsche 917 for over a year. Rodriguez was the maestro of Brands Hatch, and he and Kinnunen took the flag again at Monza after a thrilling battle with the SEFAC Ferraris. Now the Porsches had 4907 cc engines rated at 600 horsepower, and although they claimed only 580 bhp the Ferraris were evenly matched on speed. Their luck, though, was never quite as good. Sensationally, Rodriguez knocked 10s off the Formula 1 lap record at Spa, pushing the qualifying average speed up to 157 mph, and even Wyer's stem warnings could not prevent a seemingly inevitable clash at the start. Rodriguez and Siffert plunged downhill to Eau Rouge in clouds of spray, and neither man was prepared to give way. The two blue cars literally juddered as they touched on the first left-hand part of the complex and it was the Mexican who came out ahead, with black roundels on his left-side door. Times came down as the track dried out, and eventually Rodriguez established a new outright lap record in 3m 16.5s, at a speed of 160.55 mph... all of 14 seconds inside the existing F1 lap record. 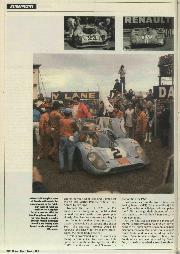 The big showdown between Porsche and Ferrari was at Le Mans. No fewer than 11 Ferrari 512Ss were listed with all the star names, including that of the young Briton Derek Bell. 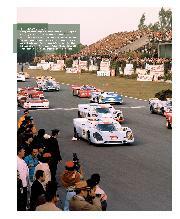 In the German camp were three Gulf-Porsches, two Porsche Salzburg entries, seven 917s in total. The race was wet, though, as rather a lot of them seemed to be in 1970, and four of the best Ferraris were eliminated in a single, bizarre accident. Reine Wisell, the talented Swede whose career, that far, had matched Ronnie Peterson's, slowed suddenly with his windscreen smeared. In a flash Clay Regazzoni, Mike Parkes and Derek Bell were upon him, cars spinning all over the place at the Indianapolis turn. None went any further. Bell's Ferrari, as he pointed out later, was undamaged. He had pressed the clutch while in the throng and burst the engine! Mike Hailwood attempted one more lap when the rainfall worsened, and crashed at the Dunlop Curve, Siffert missed a gear right in front of the pits, wrecking his valve gear, and Rodriguez's engine broke its distributor drive. This time, the Gulf team was out of the reckoning. 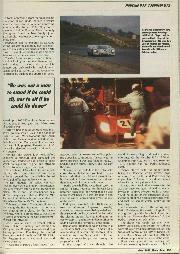 "It was my choice to go in the short-tail, 4.5 litre car," recalls Richard Attwood today, 25 years on. "With hindsight, the short tail was good because we had the extra downforce, which helped on the wet track, but the 4.5 litre engine was a disaster. "I chose it for reliability, but when we finished up 14th on the grid, 12s off pole position, I realised it was a big mistake. "It was such a big performance gap that we were out of it, definitely. Not only was it short of power, but we had a four-speed gearbox and were not allowed to use first except out of the pits. "Effectively it was a three-speed transmission, desperately slow out of the Mulsanne Corner and the Ford Chicane. We lost simply masses of time at Mulsanne, almost everything out-accelerated us. "Water was getting into the ignition so we had to keep the revs up. Eight (thousand rpm) was about as much as we were allowed, and Hans (Herrmann) looked really angry when he got in and saw the tell-tale on eight. "He didn't speak English, not to me anyway, and I was suffering terribly from mumps. I didn't know what was the matter with me, only that I felt terrible with a sore throat, swollen glands and I was awfully tired. "With one thing and another I didn't really enjoy the race, until half distance anyway when our car took the lead. Some of the driving had been terrible, with cars crashing and breaking down all over the place, and I chose to go with Hans because I wanted a steady bloke, definitely not a hero! I believe he chose me for the same reason, anyway, so our pairing was perfectly happy. "We won. It was a wonderful feeling although I felt so groggy. Nowadays you have doctors and dieticians, but then I was on my own and I couldn't eat a thing. I couldn't swallow, I could only drink liquids which kept me going. When it was over Hans announced his retirement. I thought, 'I wonder why he's done that?' I didn't realise it was the biggest ambition of his whole career, and that he'd just achieved it. No wonder he looked angry when he thought I'd been driving the car too hard!" 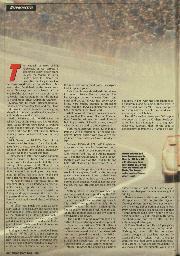 There was more door-banging between Rodriguez and Siffert at Watkins Glen, where they finished 1-2. Siffert dropped back half a lap having a wheel changed after clashing with his Mexican team-mate. They were team-mates, too, in the Yardley BRM team, and there was always plenty of needle between them. Point one: Siffert was a Porsche AG man, the works driver, while Rodriguez was the choice of JW Automotive. Point two: Rodriguez was the first choice of BRM, effectively the team leader. Porsche paid for Siffert to drive a BRM, simply to keep him out of Ferrari's reach. Then, as would undoubtedly happen today, sparks flew every time they met on the track, although their personal relationship was always polite. Ferrari unveiled the 512M model at the Osterreichring, a better car in every way. It was much lighter, at 812 kg, more aerodynamic, and more powerful too with 616 horsepower. In this car lckx and Giunti were quickest of all in Austria, a full eight seconds quicker than the previous year's pole position, and would have won at a canter but for an electrical failure. The Ferrari 512M did win, at last, at the non-championship Kyalami 9 Hours at the end of the year, when lckx and Giunti beat the 4.5-litre Martini Porsche of Siffert and Ahrens by two laps. 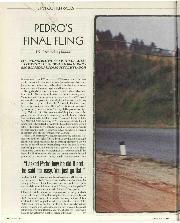 Towards the end of 1970 the FIA announced a disappointing decision that echoed the one made three years previously. The five-litre cars were too big for their boots, faster than Grand Prix cars in places, and would be outlawed at the end of 1971. The sportscar formula would be reserved exclusively for three-litre prototypes, the ruling body decided. It was a watershed point in sports car racing. Ferrari decided to concentrate fully upon the new three-litre sports car, the 312PB, from the start of the 1971 season, in preparation for 1972. Customers such as the North American Racing Team (NART), Escuderia Montjuich and Equipe National Beige could campaign the 512M, although their chances of success against the well-drilled Porsche team were next to nil. For the final season Porsche increased the 917's capacity again, to 4998 cc, power rising to 630 horsepower. Leo Kinnunen had disappointed John Wyer and team manager David Yorke and was replaced by Jackie Oliver. Brian Redman emigrated, briefly, to South Africa and was replaced by Derek Bell, so the Gulf team had a fresh look about it. It took John Wyer's team four races to get into good shape, under serious pressure from the three-litre Ferraris and improving Autodelta Alfa Romeo T33s. They had a customary 1-2 at Buenos Aires, but only after Ignazio Giunti had been fatally injured in a horrible, needless accident right in front of the pits. Rodriguez lost 90 minutes at Daytona having his gearbox rebuilt, but still managed to win, catching and passing the NART Ferrari 512M of Ronnie Bucknum and Tony Adamowicz in the last hour of the race. The Gulf Porsches were beaten at Brands Hatch, slipping on their own banana skins and handing an historic victory to Alfa Romeo, and only really hit peak form at Monza and Spa. Siffert got his revenge on Rodriguez by pushing the sports car record speed up to 162.087 mph on the Ardennes Circuit, though Rodriguez and Oliver were allowed to win. Ferrari's presence at Le Mans was relatively low-key, with 512Ms in the hands of Roger Penske (Mark Donohue and David Hobbs), and Escuderia Montjuich (Jose Juncadella and Nino Vaccarella). Just for once the beautifully prepared Penske car didn't run well, and retired early with a failure in its V12 engine. Nor did John Wyer's luck hold. Siffert collected a puncture and damaged the suspension, Rodriguez had a split oil pipe which damaged the engine, and Attwood needed to have his gearbox rebuilt. Elford's Martini Porsche 917 lost its cooling fan, which went into orbit, and for a while it seemed that Juncadella's Ferrari could pull off a most unlikely victory. At last, though, the yellow car was pushed away with a broken transmission, and a seemingly effortless victory went to Helmut Marko and Gijs van Lennep in a Special, magnesium chassis Porsche 917 Prepared at Weissach and operated by Hans-Dieter Dechent's Martini team. With just two World Championship races remaining, the five-litre sports car formula was drawing to a close. To the Osterreichring, where Pedro Rodriguez was again in scintillating form in the Gulf Porsche 917 shared with Attwood. Siffert was an early retirement with a broken clutch, resulting from starting in third gear, and Rodriguez was delayed by a battery problem. Effectively, he started three laps behind the Ferrari 312PB of Ickx and Regazzoni, on a wet track too, and reeled them in. "It was one of Pedro's finest races," says Attwood, who had reason to be disappointed about his contribution. "It was wet, he drove superbly. I was just filling in really. I had decided to retire, I knew it, and I was off the pace. "I mean, Pedro could take the Hella Licht curve absolutely flat, and you had to be so brave to do that. He told me to take it flat, but I couldn't. I was three seconds slower than him, and I lost most of it there. "Pedro drove half the race, then I took the car for 11 laps. Pedro sat on the wall for a breather, then told John Wyer that he was ready to get back in. I was brought in and gave the car to Pedro, and he drove the rest of the race." Rodriguez drove 940 of the 1000 kilometres that afternoon. Regazzoni, possibly shocked at the way he was being reeled in at three seconds per lap, crashed the Ferrari in the closing stages, leaving Rodriguez an easy victory... and rather indignant that he hadn't passed the Ferrari fair and square! Remarkably. Rodriguez wasn't even in a sweat after that epic drive. He was not a man to stand if he could sit, nor to sit if he could lie down, and Wyer used to joke that the only exercise he got was turning the pages of a book. In the cockpit of a car, though... He could do everything, and make it seem effortless. Of the Porsche 917's 15 World Championship victories in 1969, 1970 and 1971, Jo Siffert won four, Pedro Rodriguez eight. "Seppi started with the upper hand, being the Porsche works driver," says Attwood, "but by the end Pedro had the upper hand." There is no doubt about where Richard's loyalties still lie. It was utterly ironic that a week after the Austrian race Rodriguez should accept an invitation to drive Herbert Muller's Ferrari 512M (no doubt for the experience of driving the car that had been his principal rival), and that he should crash fatally at the Norisring. A backmarker moved the wrong way. Pedro Rodriguez, the master of sports car racing, the king of the Porsche 917 era, died in a Ferrari. No one else died in a 512, just Pedro. It seemed utterly unfair. The shock was hardly less than when Jimmy Clark died, and before the sadness wore off Jo Siffert died at Brands Hatch. The Swiss lost control of his BRM at Dingle Dell in the Motor Show 200 event in October, and was deeply mourned around the world. Great cars, great drivers. Nothing that followed seemed quite the same.